Hot Shadow is the first in a series of installation works where the voltage produced by video projected onto photovoltaic panels is realised as sound through direct input to an amplifier (ie, without the use of any kind of sound-producing electronics). In this iteration, large-scale natural energy events (lightning storms, filmed in Yogyakarta and Sydney, respectively) that have been recorded and stored as video are poetically ‘reconstituted’ as video energy, producing new electrical events within the solar panels, generating sound. 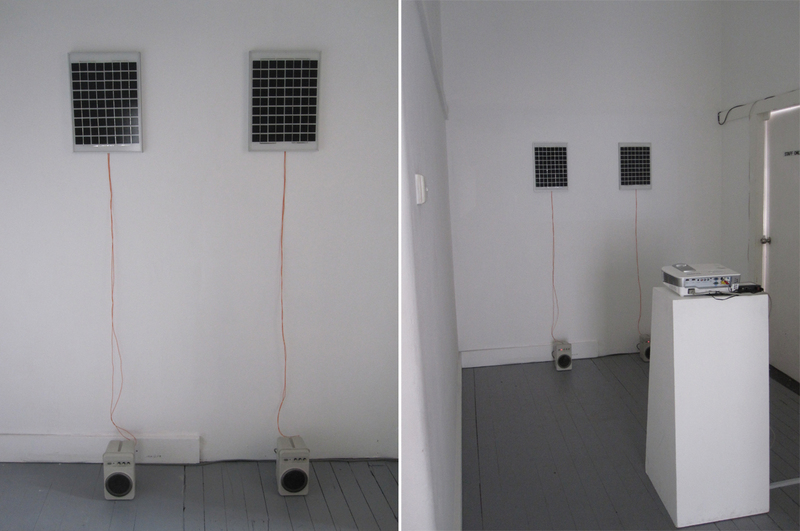 Installation view, NOW now festival exhibition, SNO Contemporary Art Projects, Sydney, Jan 2015.